When you walk into your living room, dining room, or kitchen during the latter part of the day, it’s likely that you flip the light switch up so that you can see what you’re doing. Then, after you’ve scooped yourself some more ice cream or found your car keys, you flip the switch down again to extinguish the light. This is just how indoor lighting works, right? Well, these days you’ve got additional options that might be worth considering! As a Top Rated Local® electrical installation company in Gilroy, we’ve helped dozens of residents upgrade their interior lighting with the use of adjustable controls, also known as dimmer switches. Instead of limiting you to two choice of “off” or “on” for your interior lighting, dimmer switches put your lighting control on a spectrum, making it easy to adjust according to your mood or how the room is being used at that particular moment. 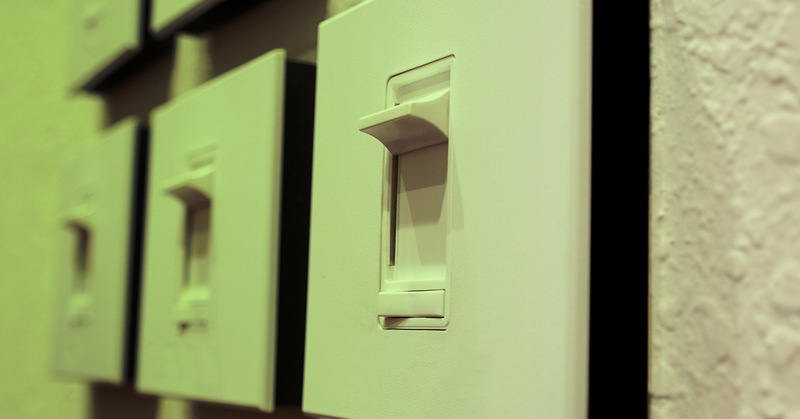 Keep reading to discover some more surprising benefits of dimmer switches, then contact Wright Electrical in Gilroy to learn more about using our electrical installation services to gain access to these useful lighting upgrades! Even if you haven’t made the switch to LED or compact fluorescent light bulbs yet, you can still save money on your electrical bills simply by getting dimmer switches installed in your highest traffic rooms. According to energy experts, dimming a light can reduce its energy consumption by up to 98 percent, resulting in up to 10 percent savings on your electrical bill! As we mentioned previously in this article, dimmer switches drastically increase the level of control you have over your home’s lighting. Watching a movie? Dim the lights nearly all the way down so that the screen is bright but you won’t trip on your way to the bathroom. Hosting a party? Dim the lights to the halfway level so that people feel comfortable but they don’t have to squint to figure out who they’re talking to. As we’ve detailed in other blogs, incandescent and florescent bulbs last a year or two at best before they have to be replaced. Simply getting dimmer switches installed can drastically increase this lifespan, however. The softer the lamp glows, the less energy it’s using, and the longer it will last. In some cases, light bulbs that would normally burn out in six months with constant on/off use will last for several years with dimmer switch installation. Have you already made the switch to compact fluorescent bulbs or LEDs in your home? Good news! There was a time when dimmer switches could not be used with these modern bulbs, but those days are gone. Paired with energy-saving light bulbs, dimmer switch installation could increase savings exponentially! Interested in dimmer switches for your home? Contact the electrical installation experts at Wright Electrical in Gilroy today. We’d be happy to come out to your home and provide an estimate for our electrical installation services, absolutely FREE!